Objective This report aims to determine the safety, pharmacokinetics (PK) and efficacy of subcutaneous golimumab in active polyarticular-course juvenile idiopathic arthritis (polyJIA). 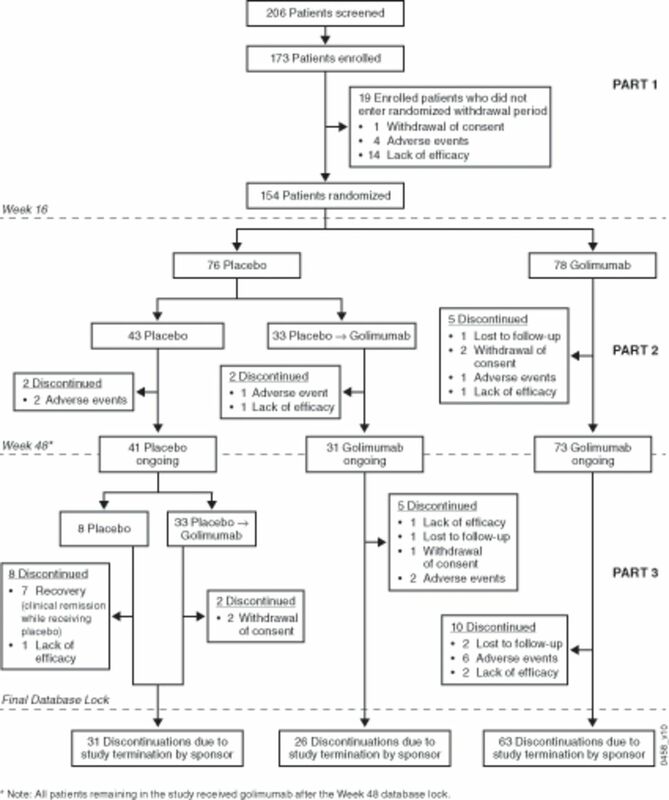 Methods In this three-part randomised double-blinded placebo-controlled withdrawal trial, all patients received open-label golimumab (30 mg/m2 of body surface area; maximum: 50 mg/dose) every 4 weeks together with weekly methotrexate during Part 1 (weeks 0–16). Patients with at least 30% improvement per American College of Rheumatology Criteria for JIA (JIA ACR30) in Part 1 entered the double-blinded Part 2 (weeks 16–48) after 1:1 randomisation to continue golimumab or start placebo. In Part 3, golimumab was continued or could be restarted as in Part 1. The primary outcome was JIA flares in Part 2; secondary outcomes included JIA ACR50/70/90 responses, clinical remission, PK and safety. Results Among 173 patients with polyJIA enrolled, 89.0% (154/173) had a JIA ACR30 response and 79.2%/65.9%/36.4% demonstrated JIA ACR50/70/90 responses in Part 1. At week 48, the primary endpoint was not met as treatment groups had comparable JIA flare rates (golimumab vs placebo: 32/78=41% vs 36/76=47%; p=0.41), and rates of clinical remission were comparable (golimumab vs placebo: 10/78=12.8% vs 9/76=11.8%). Adverse event and serious adverse event rates were similar in the treatment groups during Part 2. Injection site reactions occurred with <1% of all injections. PK analysis confirmed adequate golimumab dosing for polyJIA. Conclusion Although the primary endpoint was not met, golimumab resulted in rapid, clinically meaningful, improvement in children with active polyJIA. Golimumab was well tolerated, and no unexpected safety events occurred. Clinical Trial Registration NCT01230827; Results. Juvenile idiopathic arthritis (JIA) is a group of diseases characterised by chronic immune-mediated arthritis of unknown aetiology with disease onset before age 16.1 First-line therapy for children with a polyarticular course of JIA (polyJIA) includes non-steroidal anti-inflammatory drugs (NSAIDs) and methotrexate (MTX). Children who are intolerant to MTX or fail to achieve adequate disease control may require treatment with biological disease-modifying antirheumatic drugs (DMARDs).2 3 Golimumab is a fully human, antitumour necrosis factor (TNF)α monoclonal antibody that can be administered by either intravenous infusion or subcutaneous injection. Clinical trials in adults support the efficacy and safety of subcutaneous golimumab for the treatment of rheumatoid arthritis (RA), psoriatic arthritis, ankylosing spondylitis and ulcerative colitis.4 The objectives of the GO-KIDS study were to evaluate the efficacy, safety and pharmacokinetics of subcutaneous golimumab in children with active polyJIA despite MTX therapy. Here, we report efficacy through week 96 and safety results through the final database lock (325.6 patient-years (PY) of golimumab exposure). This three-part placebo-controlled, double-blind, randomised withdrawal trial was conducted by members of the Paediatric Rheumatology International Trials Organisation (PRINTO)5 and the Paediatric Rheumatology Collaborative Study Group (PRCSG) at 33 centres in 12 countries in Europe, Latin America, Canada and the USA. Part 1 of the study was a 16-week, open-label, lead-in period in which all patients received subcutaneous golimumab dosed at 30 mg/m2 of body surface area (maximum dose: 50 mg) every 4 weeks. At week 16, patients entered the double-blind withdrawal period (Part 2), provided they had a JIA American College of Rheumatology (ACR) 30 response,6 that is, >30% improvement in at least three of the six JIA ACR core response variables (CRVs) without ≥30% worsening in more than one of the remaining JIA CRVs compared with baseline. Patients who failed to achieve a JIA ACR30 response in Part 1 were discontinued from the study (see online supplementary material). Upon entry in Part 2 (weeks 16–48), patients were randomly assigned 1:1, in a double-blind manner, to either receive placebo or continue golimumab. Randomisation, using an algorithm, was done via an interactive voice response system with stratification by geographic region (Europe, North America, Latin America), JIA disease type (psoriatic subtype vs other subtypes), prior anti-TNFα therapy and age at enrolment. Patients continued in Part 2 until week 48, unless they experienced a JIA flare, that is, ≥30% worsening in at least three of the six JIA CRVs without >30% improvement in more than one of the remaining JIA CRVs7 compared with week 16. After week 48, patients could enter Part 3 and receive open-label golimumab at the same dose received in Part 1. However, patients randomised to placebo in Part 2 who were in clinical remission8 at week 48 were discontinued from the study per protocol. Although Part 3 was scheduled to continue through week 248, the study was discontinued by the sponsor earlier because the primary and major secondary efficacy endpoints at week 48 (see online supplementary material) were not met. Site investigative personnel and patients were blinded to study allocation starting at week 16. The study was conducted in accordance with the Declaration of Helsinki,9 Good Clinical Practice Guidelines and local requirements. Enrolment commenced in December 2010, and the last patient completed Part 2 in August 2013; the study was discontinued with the last dose of study drug administered on 31 March 2014, and the last study-related procedure occurred on 27 May 2014. The trial was registered with ClinicalTrials.gov (NCT01230827). Patients aged 2–17 years diagnosed with rheumatoid factor (RF)-positive or RF-negative polyarticular, extended oligoarticular JIA, systemic JIA without systemic features or juvenile psoriatic arthritis (JPsA),1 and disease duration of ≥6 months were eligible. All patients had to have active JIA (≥5 joints with active arthritis: ie, the presence of joint swelling or, in the absence of swelling, limitation of range of motion (LROM) plus pain on motion and/or tenderness on palpation) despite ≥3 months of MTX treatment (10–30 mg/m2/week; ≥15 mg/week for patients with body surface area ≥1.67). The study mandated that 80% of the enrolled patients be naïve to biologic DMARDs, while the remaining patients could have failed at most one anti-TNFα medication. Stable doses of NSAIDs, low-dose corticosteroids (maximum prednisone equivalent: 0.2 mg/kg/day or 10 mg, whichever was lower) were allowed. MTX and corticosteroid dosing were kept stable through week 48. Additional eligibility criteria are listed in the online supplementary material. Blood samples for pharmacokinetics (PK) and immunogenicity were collected throughout the study. PK analyses were conducted at week 8 for a subset of 30 patients, for 121 patients at week 16 and for all patients at week 48. Serum golimumab concentrations were measured by a validated electrochemiluminescent assay15 and compared with those previously found efficacious in adults with RA receiving subcutaneous golimumab. Antibodies to golimumab were assayed using a highly sensitive, drug-tolerant, enzyme immunoassay that was recently developed and validated (data on file). Patients who were positive for antibodies to golimumab were then tested for neutralising antibodies. Serum biomarkers, including interleukin-6, C reactive protein (CRP), serum amyloid A (V-PLEX platform, Meso Scale Diagnostics, Rockville, Maryland, USA) in patients with paired samples drawn at baseline and week 16 (n=147) were also evaluated. The study report followed the CONSORT statement.16 Primary endpoint analysis used the Cochran-Mantel-Haenszel (CMH) test, stratified by JIA disease categories, prior anti-TNF therapy and age. Intention-to-treat analysis was performed. For continuous variables, missing changes from baseline were imputed using the median change from baseline for all patients in the same stratum, and the last-observation-carried-forward methodology was used for missing postbaseline data. For secondary endpoints, the CMH test was used to determine statistical significance for differences in JIA ACR30/50/70/90 responders at week 48 relative to baseline. After week 48, no data imputation was performed for study visits, hence only observed data are available. Survival analysis was performed and Kaplan-Meier estimates calculated. The log-rank test, adjusted for stratification criteria, was used to test for significant differences between treatment groups in the median time to flare in Part 2. Post-hoc analyses were performed to identify predictors of flares. Sample size estimation assumed flare rates of 37% for the golimumab group and 65% for the placebo group in Part 2, based on published data.18 Assuming an 85% JIA ACR30 response rate in Part 1, it was estimated that enrolment of 170 patients was needed so that ≥134 patients (67 per group) entered Part 2 to achieve ≥90% power to detect a significant difference in JIA flare rates between groups using a two-sided significance test with α=0.05. Two planned interim analyses were performed: at week 8, in the first 30 patients enrolled for futility analyses and for PK comparison of golimumab exposure in JIA with target exposures determined to be similar to those in adults with RA; and at week 16, for population PK and to test whether the planned enrolment suffices to yield an adequate number of patients to enter Part 2. Results of these interim analyses (data not shown) indicated the study should continue as planned. In Part 1, 173 patients were enrolled and received golimumab (figure 1); of these, 19 patients discontinued the study before week 16, with 154 (89%) entering Part 2 to be randomised to placebo (n=76) or golimumab (n=78). A total of 145 (84%) patients continued in Part 3. Prior to study termination, 25 patients discontinued during Part 3, and the remaining 120 patients were discontinued due to Sponsor decision. Reasons for discontinuation are listed in figure 1. Baseline disease characteristics support that patients had active polyJIA and moderate disability. Demographic and disease characteristics for patients randomised to placebo or golimumab in Part 2 were comparable (table 1). Patients improved on golimumab as early as week 4, and JIA ACR30/50/70/90 response rates increased over time during Part 1. At week 16, 154 of 173 (89.0%) patients were JIA ACR30 responders, and 137 (79.2%), 114 (65.9%) and 63 (36.4%) were JIA ACR50/70/90 responders, respectively, with 59 (34.1%) achieving clinically inactive disease (figure 2A). All six JIA CRVs markedly improved from baseline to week 16 (figure 2B). Through week 16, response to golimumab was comparable in patients with JPsA (n=15) to that of the other 158 patients (data not shown); however, interpretation of these results is limited by the small number of patients with JPsA. 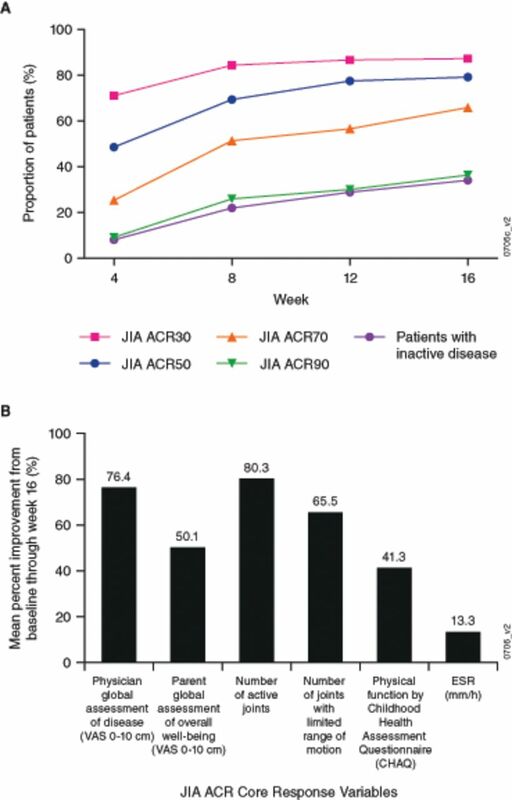 Proportions of enrolled patients with a JIA ACR30/50/70/90 response and inactive disease through week 16 (A), and the mean per cent improvement in the JIA core response variables at week 16 (B). JIA ACR30/50/70/90, ≥30%/50%/70%/90% improvement in the American College of Rheumatology juvenile idiopathic arthritis response criteria. CHAQ, Children’s Health Assessment Questionnaire; JIA ACR, juvenile idiopathic arthritis American College of Rheumatology; VAS, visual analogue scale. The primary endpoint at week 48 was not met. The proportions of patients with JIA flares were comparable in both treatment groups (placebo vs golimumab: 36/76=47.4% vs 32/78=41.0%; p=0.41; see online supplementary table S1). The median time to flare was similar between groups (placebo: 95.6 weeks; golimumab: 108.4 weeks; figure 3A). At week 48, and irrespective of treatment allocation in Part 2, the majority of patients were improved compared with baseline. There was no difference in the frequency of clinical remission between treatment groups (placebo vs golimumab: 11.8% vs 12.8%; p=0.848; figure 3B). Mean changes in JADAS71-ESR scores were also similar in both treatment groups at week 48 (figure 3C). Flare rates among patients who continued with golimumab after week 16 remained relatively similar regardless of the baseline CRP levels, while flare rates increased with increasing baseline CRP levels for patients receiving placebo (figure 3D). (A) Kaplan-Meier plot of JIA flare events starting Part 2 of the study. (B) Proportions of randomised patients with a JIA ACR30/50/70/90 response and clinical remission at week 48 as compared with baseline (week 0). (C) Mean change in JADAS71-ESR through week 48. (D) The proportion of patients who flared during the trial. Flare rates remained relatively stable over time among patients who continued with golimumab after week 16 and remained relatively similar regardless of the baseline CRP levels. However, among patients receiving placebo in Part 2, the proportion of patients who flared in Part 2 increased depending on CRP levels at baseline: for example, for patients with baseline CRP levels ≥0.02 mg/dL, the flare rate was 48.6% (35/72) and for those with baseline CRP levels ≥1.0 mg/dL, the flare rate was 86.7% (13/15). JIA ACR30/50/70/90, ≥30%/50%/70%/90% improvement in the American College of Rheumatology juvenile idiopathic arthritis response criteria; CRP, C reactive protein; JADAS71-ESR, Juvenile Arthritis Disease Activity Score using erythrocyte sedimentation rate; JIA, juvenile idiopathic arthritis. Among the 76 patients randomised to placebo, 33 flared and received golimumab before week 48, 33 remained on placebo through Part 2 but switched to golimumab after week 48, while the remaining 10 patients were in clinical remission at week 48. The latter patients were discontinued as per protocol at week 48. Measures of treatment response and JIA activity observed at week 96 are summarised in table 2. At week 96, the randomisation groups did not differ significantly in the proportion of patients achieving clinical inactive disease (placebo vs golimumab: 27/64=42.2% vs 33/69=47.8%; p=0.119). At the time of the final database lock (golimumab for up to 160 weeks), there were no differences in the proportion of patients in remission between randomisation groups: 44.9% (35/78) of patients randomised to golimumab during Part 2 and 43.4% (33/76) of patients randomised to placebo during Part 2; nor were there differences in the mean JADAS71-ESR scores (data not shown). In Part 1, higher JIA ACR response rates at week 16 were associated with lower baseline levels of inflammatory cytokines (eg, interleukin-6, CRP, serum amyloid A), blood neutrophils and ESR (see online supplementary figure S1, supplementary table S2). Likewise, levels of inflammatory cytokines (baseline, week 16) were associated with week 48 JIA outcomes, positively with JIA flare rates and negatively with JIA improvement (inactive disease, clinical remission) in patients randomised to placebo but not those who continued golimumab in Part 2 (see online supplementary figure S2, supplementary table S3). For the safety population (n=173) AEs and SAEs that occurred throughout the study are summarised in table 3, providing information on 325.6 PY of golimumab exposure. Overall during the study, 160 (92.5%) patients reported ≥1 AE and 39 (22.5%) patients reported 35 SAEs. AEs that occurred in ≥10% of patients included upper respiratory infections (28.3%), nasopharyngitis (25.4%), JIA flare (22.5%) and vomiting (14.5%). Rates of AEs and SAEs were similar across the two exposure groups in Part 2 (AEs/SAEs per 100 PY exposure; randomised to golimumab: 358.5/17.1, randomised to placebo: 526.3/32.5). There were 116 AEs occurring in 88 patients that were considered possibly, probably or definitely related with golimumab treatment by the investigator and 12 AEs that were considered severe (conjunctivitis, pyelonephritis, otitis media, skin bacterial infection, acute tonsillitis, appendicitis, peritonsillar abscess, gastritis, hypoglycaemia, worsening of JIA and demyelination). The latter occurred in an 18-year old female who had received golimumab for over 20 months when, based on clinical features and MRI, multiple sclerosis (MS) was diagnosed; MS was considered to be very likely related to golimumab exposure, with clinical symptoms and imaging features improving after golimumab discontinuation. At week 4, there was one patient with toxic hepatitis (alanine aminotransferase levels of ≥5 times upper limit of normal, total bilirubin normal). This SAE was considered possibly related to study drug and resolved despite golimumab continuation. AEs included two cases of new-onset iridocyclitis; one in the placebo group and one in the golimumab group. No deaths or malignancies were reported during the study. A total of 16 patients had a total of 21 AEs or SAEs that led to study discontinuation (including worsening of JIA, transient transaminitis, alanine aminotransferase increased, aspartate aminotransferase increased, serum sickness-like reaction, uveitis, chest pain, gall bladder oedema, affective disorder, positive QuantiFERON test and demyelination). Injection site reactions occurred with 23 (0.6%) of a total of 4019 injections; none of the reactions were serious or severe or led to study discontinuation. The incidence of injection site reactions was similar between the treatment groups during Part 2. Steady-state trough serum golimumab concentrations at the dosage regimen chosen for this study were similar to those observed in adults with RA receiving approved dosages (data not shown). A total of 46.8% (72/154) of the randomised patients tested positive for antibodies to golimumab, of which eight (8/154=5.2%) had high-titre antibodies (>1:1000). There was no apparent difference in the incidence of antibodies to golimumab between patients who received golimumab continuously compared with those receiving placebo in Part 2 (14/28=50.0% vs 16/35 45.7%). Sixty-six patients were evaluable for neutralising antibodies (NAb); of these, 45.5% (30/66) were positive for NAb (overall NAb incidence of 19.5%). Patients who were antibody positive with low titres had golimumab concentrations similar to patients who were negative for antibodies to golimumab. However, patients who were antibody positive with titres >1:1000 generally had NAb and lower golimumab concentrations. In this study, the formation of antibodies to golimumab did not appear to have a substantial impact on clinical efficacy. Of the eight patients with titres >1:1000, none experienced disease flare, and seven achieved JIA ACR30 response. Additionally, a positive antibodies-to-golimumab status and antibody titre levels did not appear to be associated with injection site reactions. However, the number of patients with high antibody titres was small, limiting the ability to definitively assess the clinical impact of antibodies to golimumab. Results of this study demonstrate that subcutaneous golimumab dosed at 30 mg/m2 body surface area (maximum: 50 mg) every 4 weeks resulted in a rapid response to open-label therapy, had an acceptable safety profile and yielded a similar PK profile as that achieved in adults with RA.19 20 On background medications, including mandatory MTX, after three doses of golimumab, 34.1% (59/173) of the patients reached clinical inactive disease status. Importantly, the primary endpoint of this trial was not met as the placebo and golimumab groups did not differ in JIA flare rates during the double-blinded period of the study (Part 2). The randomised withdrawal design has been successfully used for the study of biological DMARDs in JIA, including those blocking TNFα. This trial design was introduced in JIA for ethical reasons to minimise placebo exposure13 and for sample size consideration, but the design also has limitations: the clinical effects of biological DMARDs often exceed their pharmacological half-life, resulting in delayed flare events in the placebo groups.18 21 The reasons for the sustained JIA control in patients receiving placebo in Part 2 remain unknown. However, levels of inflammatory cytokines, especially at baseline, were significantly associated with JIA courses (high: JIA flare, low: inactive disease, clinical remission) at week 48 in the placebo arm but not the golimumab arm. Thus, the low inflammatory burden of the study population (mean baseline CRP: 1.0 mg/dL) may have contributed to the low frequency of flares in the placebo group during Part 2. Although not studied specifically, we do not think that the failure of this study in reaching the primary endpoint was due to inappropriate golimumab dosing based on exploratory PK analyses (data not shown); and drug levels in polyJIA were similar to those shown to be therapeutic in RA. In fact, exposure to medication for most prior clinical trials of biological DMARDs in polyJIA found to be efficacious in adults with RA also yielded a robust response in polyJIA. The safety profile of golimumab was consistent with that observed in adults and other TNFα agents in JIA, with few patients discontinuing the study because of AEs. Although occurrence of MS in this study is a concern, it has been reported with other anti-TNFα DMARDs in both JIA and adult RA. In conclusion, the primary study endpoint was not met. 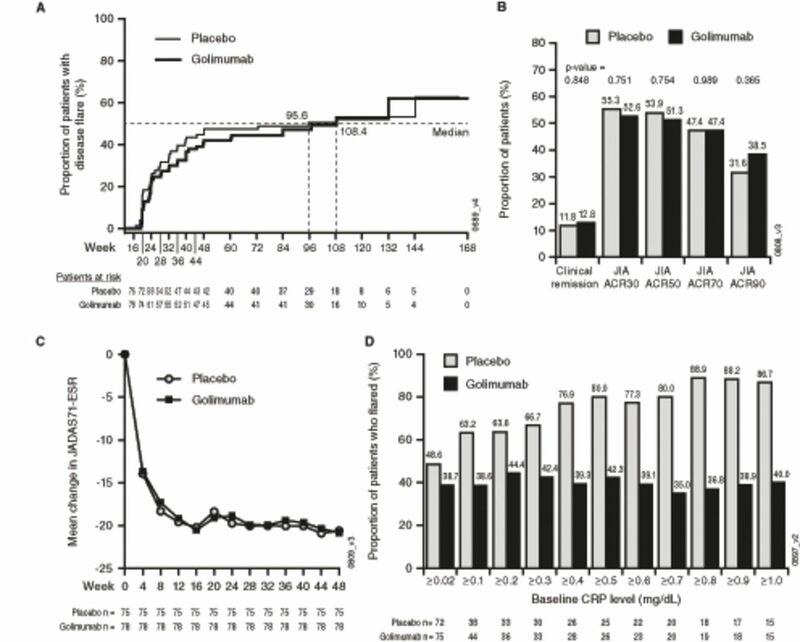 However, treatment with golimumab in children with active polyarticular course of JIA resulted in rapid clinically meaningful improvement that was maintained over time even in patients who received placebo after week 16. Golimumab was well tolerated, and no unexpected safety events occurred. The authors thank the staff from the PRINTO and PRCSG coordinating centres, and the remaining PRINTO and PRCSG centres which enrolled patients in the GO-KIDS trial. Additional investigators include from Austria, Christian Huemer MD; from Belgium, Carine Wouters MD; from Brazil, Claudia Magalhaes MD; from Canada, Adam Huber MD; from Finland, Paula Vähäsalo MD; and from the USA Diana Milojevic MD, Egla Rabinovich MD. Hans-Iko Huppertz, MD, PhD, Bremen, Germany, declined the offered authorship of this paper but gave permission to include patients recruited from his centre to be considered in the analysis. The authors also thank Kim Hung Lo, PhD, for involvement in the trial design, Stephen Xu, MS, for additional statistical support Nancy Peffer, BS, and Carol Franks, BS, for biomarker data generation, all from Janssen Research & Development, LLC, and Rebecca Clemente, PhD, of Janssen Scientific Affairs, LLC, for editorial assistance. A special thanks to Dr Alan Mendelsohn, formerly of Janssen Research & Development, LLC for his contributions in study design and implementation and advocacy for all children enrolled in GO-KIDS. ; International League of Associations for Rheumatology. International League of Associations for Rheumatology classification of juvenile idiopathic arthritis: second revision, Edmonton, 2001. J Rheumatol 2004;31:390–2. Simponi: package insert. Janssen Biotech, Inc: Horsham, PA, 2014.
. Preliminary definition of disease flare in juvenile rheumatoid arthritis. J Rheumatol 2002;29:1058–64. Declaration of Helsinki. Recommendations guiding physicians in biomedical research involving human subjects. BMJ 1996;313:1448.
; Paediatric Rheumatology International Trials Organisation. Cross-cultural adaptation and psychometric evaluation of the Childhood Health Assessment Questionnaire (CHAQ) and the Child Health Questionnaire (CHQ) in 32 countries. Review of the general methodology. Clin Exp Rheumatol 2001;19:S1–9. ; Childhood Arthritis and Rheumatology Research Alliance; Pediatric Rheumatology International Trials Organization; Pediatric Rheumatology Collaborative Study Group. Preliminary criteria for clinical remission for select categories of juvenile idiopathic arthritis. J Rheumatol 2004;31:2290–4. HIB and NR contributed equally. Contributors Study design: HIB, NR, AM, DJL; data collection and/or analysis: HIB, NR, NT, GH, VGC, VP, CAM, AR, EA, NRP, VK, DJK, MRMV, IN, EDS, RJ, ES, MB, KM, ARK, WE, IF, BRL, FS, KEG, ZX, JHL, LK, SLL, MJL, DJL, AM; manuscript: All authors drafted and/or revised the manuscript and approved the manuscript for submission. Funding This study was funded by Janssen Research & Development, LLC, a wholly owned subsidiary of Johnson & Johnson, and Merck/Schering-Plough. Competing interests HIB has served as a consultant and steering committee member for Janssen Research & Development, a consultant for AstraZeneca, Pfizer and Takeda and received research support from Novartis, Roche and UCB. NR served on the speaker’s bureau and as a consultant for AbbVie, Amgen, Alter, AstraZeneca, Baxalta Biosimilars, Biogen Idec, Boehringer, BMS, Celgene, CrescendoBio, EMD Serono, F. Hoffmann-La Roche, Italfarmaco, Janssen, MedImmune, Medac, Novartis, Novo Nordisk, Pfizer, Sanofi Aventis, Servier, Takeda and UCB Biosciences GmbH. DJL has served as a consultant for Boehringer Ingelheim, Celgene, Janssen Research & Development and Novartis, as a trial investigator for AbbVie, Bristol-Myers Squibb, Janssen Research & Development, Roche, Pfizer and UBC and received research support from the National Institutes of Health. NRP received fees from AbbVie and Roche. FS received research support from Janssen. KM received research support from Pfizer, AbbVie, Roche and Deutsche Kinder-Rheumastiftung and fees from AbbVie, Genzyme, Medac, Pfizer and Pharm-Allergan. IN received fees from AbbVie, Bristol-Myers Squibb, Novartis, Pfizer and Roche and grants from Pfizer and Roche. EA received research support from AbbVie, Bristol-Myers Squibb, Janssen, Novartis, Pfizer and Roche and fees from AbbVie, Bristol-Myers Squibb, Medac, Merck Sharp & Dohme, Novartis, Pfizer and Roche. KEG, ZX, JHL, LK, SLL and MJL are employees of Janssen Research & Development, LLC and own stock in Johnson & Johnson. AM received speaking and consulting fees from AbbVie, Boehringer, Celgene, CrescendoBio, Janssen, MedImmune, Novartis, Novo Nordisk, Pfizer, Sanofi Aventis, Vertex and Servier. Nothing to disclose: NT, GH, VGC, CAM, AR, DJK, EDS, VP, MRMV, ES, MB, ARK, VK, RJ, WE, IF, BRL. Ethics approval Institutional Review Board or Ethics Committee at each site. Correction notice This article has been corrected since it published Online First. The PRINTO and PRCSG statement has been added to the list of authors.